A healthy email marketing list can be a huge asset to a business. But it’s not always easy to build up a marketing list, or to populate it with the right email addresses. Here are five tips to help you build an email marketing list that in turn will help your business grow. 1. Make subscription easy and appealing. If a “subscribe” form is hidden away at the bottom of a page, it’s not going to get a lot of attention or subscribers. 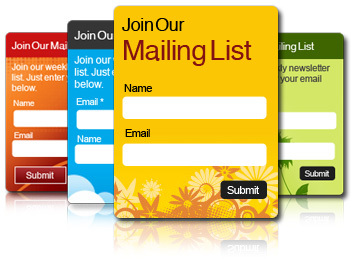 A consistent, clean, and conspicuous form on more than one of your site’s pages will help facilitate email signups. Forms near the top of the page tend to perform better, as do those with a clear message about what a reader will gain by signing up for. That can include anything from special offers to gaining industry knowledge. Whether you’re in touch with customers or clients face to face at a networking event, sending them direct mail, or interacting at a conference, don’t miss a chance to ask for permission to sign them up. 3. Help people spread the word. Offering an incentive to subscribers to recommend new addresses is an effective way to engage in word-of-mouth marketing. If your site has viral features that allow visitors to forward products, services, or information to their contacts, you can incorporate email sign up into those. Have some goals in mind about what people you want on your list, and how many of them you want. It’s great to grow your list, but with a marketing list quality is better than quantity. Better to have targeted data, even if it means a smaller list, than a large list of the wrong people. 5. Let people know you take privacy seriously. Click here to learn more about email marketing and email marketing services for advanced users.